Heidi Craig, founder of the “ecoluxe” online retailer Philtre, contacted us a few months back to let us know about the launch of her new site. I checked it out immediately and was drawn to the brands she carries: your natural favorites like Acure, Alima Pure, Meow Meow Tweet, Dr. Alkaitis, and Rahua (just to name a few)… and also some very exciting brands that I have yet to try, but that are perfectly in line with Unsullied’s motto. Alaska Glacial Mud Co., Camamu, COOLA, Innersense, and OSEA were on this list, among many others. After a two hour conversation with Heidi on the phone, I not only made a new friend, but was so supremely impressed with her mission. 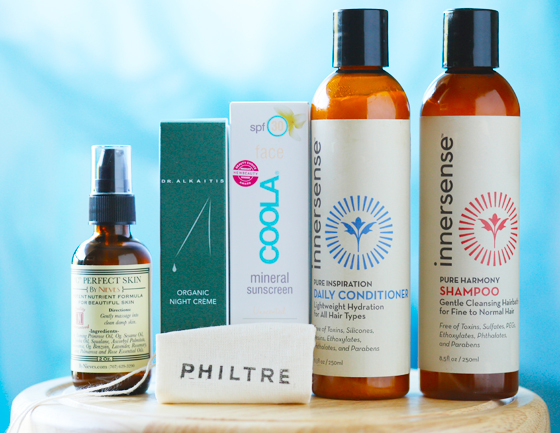 Philtre, based in San Francisco, is not only a non-toxic, cruelty free, ethically produced online boutique, but it also only sells products that are made in the U.S. This all-natural haven was formed after Heidi spent four years working with the United Nations and realized just what an impact our personal shopping decisions can have on health, environment, economy and quality of life. She wanted to create a place where people could shop and feel good about what they were buying, and committed a great amount of detail and hard work into streamlining Philtre into the green beauty veritable CANDY STORE it is today. Okay, they don’t actually sell candy…but they may as well to me, because brands like By Nieves and Persephenie are my equivalent to a big chocolate bunny the size of my 12-pound cat. What I mean is: Philtre is my happy place!